The single ﬂute gundrill, with its ability to machine very straight deep holes and hold excellent ﬁnishes, was originally developed for gun barrel manufacturing. Today, this drill is designed for deep hole drilling in virtually any material. The gundrill requires high-pressure coolant through the tool, keeping the cutting edges lubricated and providing adequate chip evacuation down the ﬂute channel. Star SU’s Single ﬂute gundrill product line diameter range is .039” [1.00mm] through 1.500” [38.10mm] as a solid carbide head. 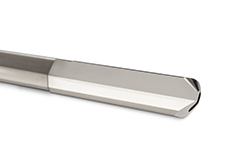 Larger diameter tools are available using a brazed inserted blade design. All gundrills can be made to any speciﬁc length. Lengths over 72” [1828 mm] will have an additional weld joint in the body of the tool. The gundrill is designed to drill holes from solid material, and can produce bottom hole conﬁgurations, and minimize burr at intersections. The gundrill can achieve precision holes in one pass thus eliminating the need for secondary passes, and is a tool for consistent hole-to-hole reproduction. The design of the single-lip, straight deep “V” ﬂutes and high coolant pressure allows for fast, consistent penetration without the need for pecking. Star SU also offers a High Performance Gundrill, which is capable of running up to 3-4 times faster than the standard gundrill. This technology’s has been proven in material such as 416 SS, 4150v, 4140 and other materials. The success of this process is a combination of special tool design having a positive rake face, edge preps and finishes in conjunction with establishing speeds and feeds for proper chip control. Advance cutting tool coatings are also applied based on each specific customer application. Kidney Shaped Hole (KDS) – This style is recommended for cutting diameters under .375″ [9,53mm]. This extruded shape assists in achieving higher flow out of the front of the tool, thus allowing for better chip evacuation. This coolant hole conﬁguration also can assist when lubricity is minimal. Single hole (GDS) – This provides maximum strength to the carbide head, for challenging applications. Star SU has a wide range of contours/wear pads that gives the tool the burnishing effect needed to obtain the ﬁnish and hole size while controlling heat/friction for a given material. These features are strategically engineered per application along the outer diameter for the length of the carbide head. Point angles and clearances play an instrumental part in the equation. The proper selection and reproduction of geometry is crucial to its total overall performance. These angles and clearances can be modiﬁed to change the cutting performance results, and also assist in modifying the high-pressure coolant for better chip ﬂushing or reducing the heat generated at the cutting edges. Every material has its own machinability characteristics. With ﬁve decades of design and cutting too experience, Star SU’s gundrill engineering group designs the tool to custom ﬁt each application. Star Multi Step Gundrills are used to produce holes concentric to one another. They are available in a wide array of diameters and step lengths, with a variety of transition forms between diameters and are capable of cutting a variety of materials. Consult engineering regarding length of step and diameter ratio. The point location balances the cutting forces. For most applications this dimension is 25% of the diameter, or Ø/4. If the point location is greater than Ø/4 (closer to C/L) the tool will cut tighter. Conversely, when the point location is less than Ø/4 (closer to the OD) the tool will cut more freely. The outside angle will vary based on the material being machined and process conditions. It is controlled by our manufacturing tolerance of ± 1°. A larger outside angle measure will assist in maintaining straightness, but the tool will cut tighter (greater heat generation). A smaller outside angle allows the tool cut more freely, but straightness is sacrificed. The inside angle is used to balance the cutting forces. A larger inside angle will reduce thrust and increase coolant flow. A smaller inside angle will push the drill towards center causing a tighter hole. As with the outside angle our manufacturing tolerance is ± 1°. The purpose of the Slash/Roll clearance is two-fold. The first function is to control the coolant flow up the flute channel thereby providing sufficient chip evacuation. The second function is to provide adequate support necessary to counter the forces acting on the cutting edges. The measure of this angle and its rotation relative to the cutting face will vary based on material, application, and operating parameters. The Outside angle clearance on tools greater than Ø4.00 mm is primarily cam relief. For tools less than Ø4.00 mm facet relief is employed (5-facet grind). The type of relief chosen can also vary based on the end users regrind capabilities. The inside angle clearance is almost exclusively straight clearance. Its angle measure is usually the same as that of the outside angle clearance. By strictly controlling all of the above features we obtain consistency from grind to grind and insure repeatability of size, straightness, and surface finish in the machined part. High performance single flute gundrills utilize chip breaker technology and advanced coatings that optimize chip evacuation. Additionally feed rates are increased by 2-3x the standard steel gundrill. Star SU LLC offers three programs to cover your gundrill needs. When you need gundrills in a hurry, call Star SU LLC for quick results. Star SU carries a large range of stocked gundrills with various diameters, ranging from .078″ – .75″ in various lengths, delivered within 24 hours. Star SU offers a 24-hour delivery service for standard diameter and length mold making gundrills. These mold drills are available in diameters ranging from .1885″ – 1.5″. Standard 1.25″ diameter by 2.75″ long drivers apply. If the size you need is not a stocked item, please contact us. We offer an additional expedited program to meet our customers needs. Star SU offers custom designed single fl ute gundrills in diameters ranging from 0.092″ – 1.508″, shipped within 72 hours (three working days). This program allows special designs for specific diameters, overall lengths, point geometries and contours. Please specify type of material machined at time of order placement to ensure proper design.